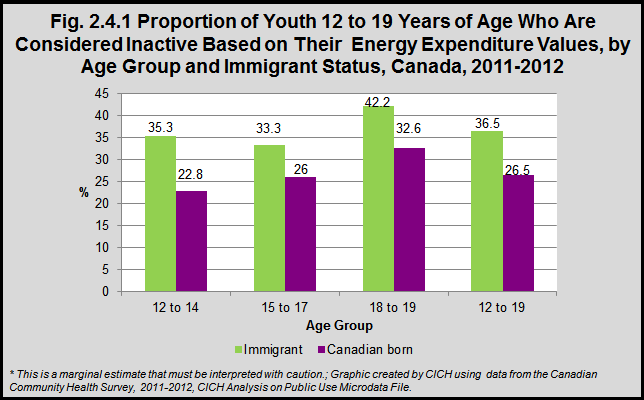 Canadian born youth between 12 and 19 years are less likely to be inactive than are their peers who were born outside of Canada. Just over one-quarter (27%) of Canadian born youth are considered inactive compared with 37% of youth who are foreign born. Among both groups, young women are more likely to be inactive than are young men. Forty-five percent of young immigrant women (12 to 19 years) are considered to be inactive compared with 28% of young men. Those figures are 31% and 22% respectively for Canadian born youth. Older youth are more likely to be inactive than are younger youth – among both groups. An important determinant of health for young people is involvement in regular physical activity. These findings are substantiated by analysis of the Canadian Health Behaviour in School-Aged Children’s survey data, which found that youth born outside of Canada were less likely to be active than peers born in Canada.1 This study also found that time since immigration and ethnicity were associated with participation in physical activity – specifically that the longer the youth were in Canada the more likely they were to have physical activity levels that were close to their Canadian born peers. In addition, East and South-East Asian youth were less likely to be physically active than Canadian born youth.